In July 1992 the world’s best athletes had gathered in Barcelona for the Olympic Games but as the track and field events were due to begin promising British sprinter Jason Livingston was heading home in, as these things are always reported, “disgrace”. Within days Linford Christie would win the 100m title while the then 20-year-old seen as his successor left Spain with his career in tatters and his stated ambition to cleanly emulate the on-track achievements of the Canadian Ben Johnson, infamously stripped of the most coveted Olympic gold medal of all four years earlier, only fulfilled in the most unsatisfactory manner after a positive drugs test was revealed. By Christmas that year Livingston was banned from track and field for four years – a longer disqualification than Johnson had received for the most notorious failed drug test in Olympic history – and living in south Wales having moved from Croydon, south London where he’d grown up. When the starting gun was fired on the following summer’s athletics season persona non grata Livingston was exploding not out of the blocks but out of the backfield for the Gwent Mustangs American Football team. Livingston had once lost his job in the post room of the Daily Mirror newspaper after skipping a shift to run in an indoor meeting but in the Olympic year the Croydon Advertiser had raised £9,000 to fund the sprinter who’d also received £5,000 from a Texaco/Daily Mail scheme to support young athletes. That summer Livingston lowered his 100m personal best to 10.09s, putting him ahead of Christie for a while in the UK rankings. I remember watching the 1992 AAA Championships at Birmingham on the television and at the start line of the 100m final, in effect the British Olympic trial, in front of a packed Alexandra Stadium only Livingston stood believing himself the veteran Christie’s equal. Ten seconds later Livingston had to accept second place to the 32-year-old, who was running into the form of his life, but it was clear he was following a path to sporting and financial success. However by May 1993 Livingston’s career was truly amateur playing a minority sport whose popularity and participation levels had already peaked. Olympic Games and World Championships were swapped for the Premier Division South West Conference of the British National Gridiron League. Despite the grand title the third of UK Gridiron’s four tiers at the time. There are few details available of Livingston’s time with the Mustangs but as this video (below) shows his pace was genuinely frightening and he was a more than useful running back to the Welsh side, even if his pass blocking was woeful. The website BritballNow records Livingston as having rushed for one touchdown and 89 yards from just five attempts on his debut as well as having recorded a 112 yard rushing game and a touchdown later in the season. Neither is it clear how the banned sprinter had come to play for the Mustangs but it appears, perhaps unsurprisingly, American Football wasn’t his first choice second choice sport. I can still remember a photograph of Livingston in his athletics shorts and vest plastered on the front page of the South Wales Echo my dad had, as usual, brought home in autumn 1992. The headline screamed something about ‘Disgraced sprinter turned away by Bluebirds’. Livingston, it reported, had attempted to earn a contract with Cardiff City, then in the very early stages of what would be a promotion winning season from the English fourth tier. “A fast refusal for new recruit: Robert Cole reports on the disgraced sprinter Jason Livingston’s bizarre training session with Cardiff City,” was how The Independent explained the attempt to forge a new career at a time the positive test given in the run up to the Olympics was still being challenged by Livingston. Cole revealed the friend was Welsh sprint hurdler Paul Gray, then a few years away from his own successes on the track. Gray had apparently arranged the training session through a contact. Cole’s named source? The Welsh Olympian and hurdles legend Colin Jackson. Livingston, said Jackson, had “always shown himself to be a pretty nippy player” whenever the Great Britain teammates had “played around” and he should be given his opportunity in another sport. “I think people should let him get on with what he’s doing and not hold anything against him,” Jackson told Cole. 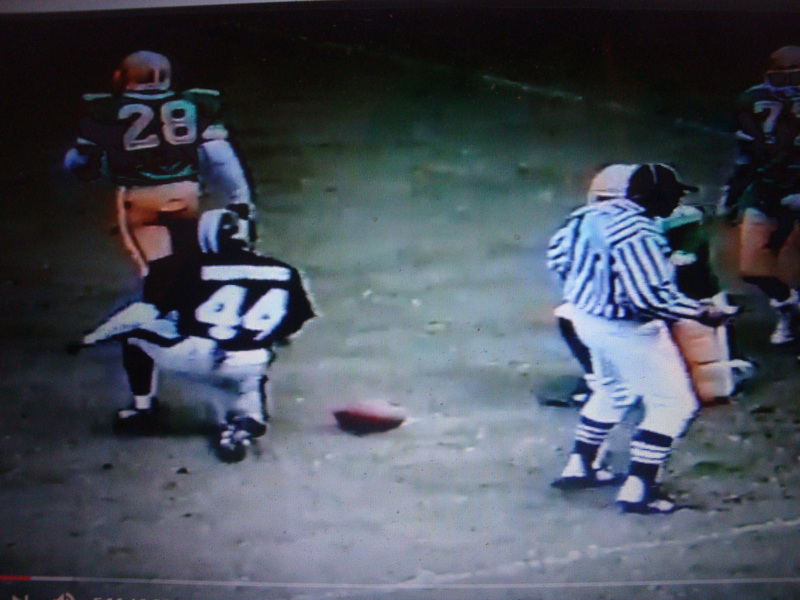 The Gwent Mustangs had no such problems however and once Livingston kited up the Welsh media, whose interest in American Football had waned since the 1980s, paid attention once more and the signing also raised the profile of the lowly Mustangs within Britball. From memory I think Livingston played more than the one season for the Mustangs. He returned to athletics in time for the 1997 indoor season – and he would set a personal best of 21.39s for 200m on the boards in 1999 but never beat his 100m PB. “During his time in the wilderness, Livingston, who was sent home from the 1992 Olympics after it was announced he had tested positive for the banned steroid methandianone, has tried his luck at rugby league, American Football and football before taking up his present job as a debt collector,” The Independent reported on his return to athletics. “I’ve had so many dark times. Soul searching and depression which almost saw me go off my head… but I believe I can run faster than ever,” said Livingston, giving an insight into life beyond the “cheat, shame and disgrace” headlines. Back then British American Football didn’t stop Livingston, who insisted he had inadvertently taken the banned substance in a supplement drink, from competing in an amateur sport for no greater prize then grinding and occasionally winning with a band of brothers. American Football in Britain has always been blessed with exceptional athletes and genuine ballers but as an imported sport has also, maybe at times out of necessity, been a home for the outsiders who for some reason haven’t quite found their place in the country’s more traditional games. Amateur American Football shouldn’t be a safe haven for doping and cheating – but neither does it provide a great incentive for the use of steroids. That’s not to say Britball is free of steroid use – though I have no evidence other than the British American Football Association’s (BAFA) new partnership with the UK Anti-Doping Agency of such a problem. But in certain areas of Britain there is known to be a social issue of young men, often due to concerns about their body image, using steroids. BAFA could instigate an education programme to address any potential doping issues without subjecting all of its players to the same punitive sanctions regime imposed on Olympic athletes or millionaire soccer players. And remember there is no public funding, from the National Lottery or government-funded sports agencies, for Britballers in the way there is for some amateur Olympians from minority sports. I suspect BAFA has introduced the policy in a tick box exercise to please government-funded governing bodies and prove it is “developing” the sport. But for all its governance structures BAFA is administering an amateur, grass-roots sport that even at a national level is comparable to local league soccer and rugby. Part of the reason the game is played on a national or a very wide regional basis is most teams are the only clubs in their town or city. Teams are often 50 miles or more away from their closest rival. Comparisons with testing in soccer and rugby, even below the full-time level, do not hold up. Rugby union, which with League holds top spot in UK Anti-Doping’s league of shame for the most bans, is part of the professional game’s micro-climate. British American Football stops and starts at an amateur level. If players move to Europe for semi-pro contracts, perhaps the only likely financial incentive for Britballers to dope, those leagues should be responsible for ensuring their game and players are clean. BAFA should seriously consider if this policy will attract players and could even deter existing players, who even for simple mistakes, could be banned, named and shamed. Top level sport has just been shocked by the medical exception policy that allows athletes to take some normally prohibited substances. What amateur player, who pays subs to play for fun, would bother with that bureaucracy and sharing their private medical information? Some players may take recreational drugs, but imagine explaining to your boss you’ve been banned from all sport as you’d pissed in a plastic cup after an American Football game and found to be a occasional or even habitual weed smoker. Maybe you only started smoking ganja as former NFL running back Ricky Williams believes it has proved preventative for the whole concussion thing that’s been worrying you and your partner – who thinks football is taking up too much of your time anyway? Should a player ever fail a drug test BAFA will have achieved headlines once again for Britball. Even a relatively minor infringement will make the news, perhaps even the sport in brief columns in the national press. But does a player getting selected for the Great Britain national team, or earning a semi-pro contract in Germany, even feature in the local paper? BAFA may not want the sport to once again provide a banned professional athlete with the opportunity to regain their sporting pride. It may well believe putting every professional policy in place will grow the game but it needs to ask if those aims are shared by its member clubs and of course their players. You can read BAFA’s statment announcing its partnership with UK Anti-Doping here. This entry was posted in Sports and tagged American Football, athletics, Bluebirds, Britball, British American Football Association, Cardiff, Cardiff City, doping, Gridiron, Jason Livingston, Newport, Newport Mustangs, NFL, UK Anti-Doping. Bookmark the permalink. Jason did not play in that year v Plymouth. It was about 2 years latter. 93 to 94 mustang losing seasons. After left they had winning seasons 95 and 96. Jason was too fast for his blockers and had a tendance to fumble. He did try rugby to. He canto us then moved to a london team that paid. Hi Jon thanks for your comment. The story does say that Jason Livingston played for the Mustangs in 1993 and the video, which was posted by someone else to You Tube, is also dated 1993. 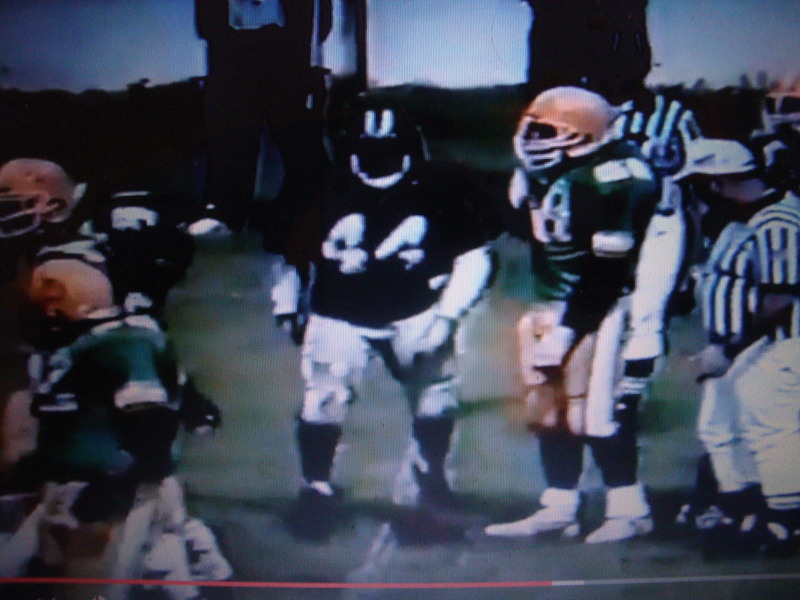 At around 4.55s into the video number 44 for the Mustangs carries the ball and the stadium announcer calls his name as Jason Livingston.